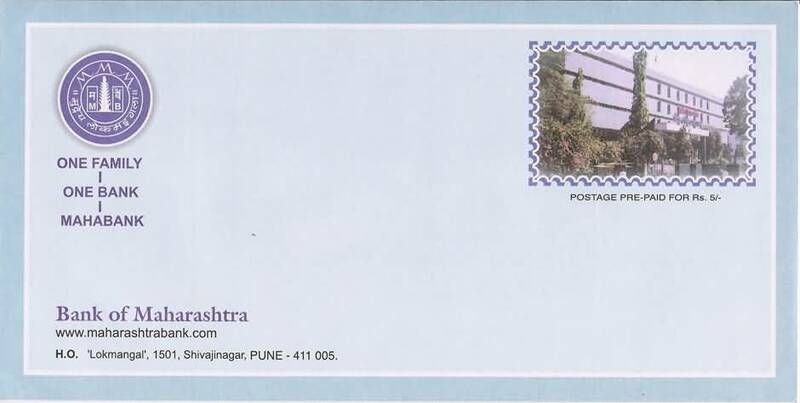 The customized postal stationery in India is an offshoot of the Greeting Post. 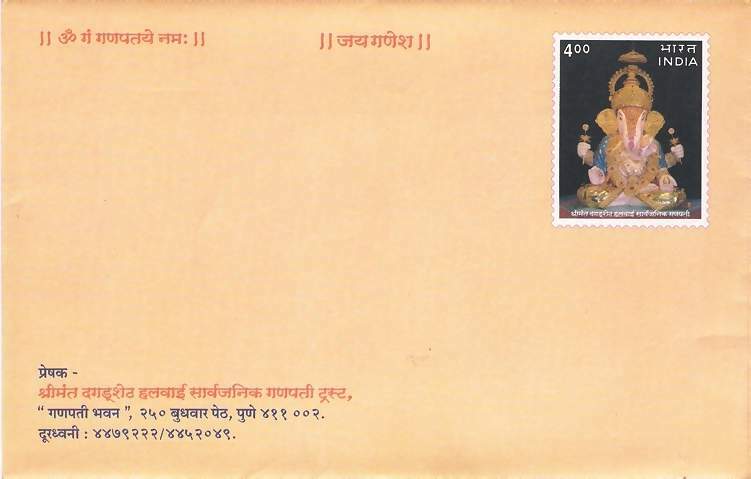 India Post introduced Greeting Post on September 6, 2000 with a set of 32 greeting cards with stamped envelopes. The imprinted postage stamps on the envelopes were an exact replica of the cards with name of the country, denomination and simulated perforations. The cards and consequently the envelopes were of two sizes - small (10.9 x 17.3 cm) and medium (12.3 x 19.3 cm). The envelopes for the small cards carry smaller size stamp imprint (4 x 3 cm) while the medium size cards have larger stamp imprint (5 x 4 cm). The denomination of all stamps was Rs. 3 that prepays the inland letter rate. The small size greeting cards were priced at Rs. 12 and the medium size cards at Rs. 15 each. India Post offered trade discounts on these prices to bulk buyers, retailers, and distributors. India Post provided for customization of the greeting cards by offering to undertake printing messages on cards and sender’s address on envelopes for bulk buyers without any extra charge. Initially 5% of the quantity printed, about 1000, was produced without message on the cards so senders can customize the messages as well. 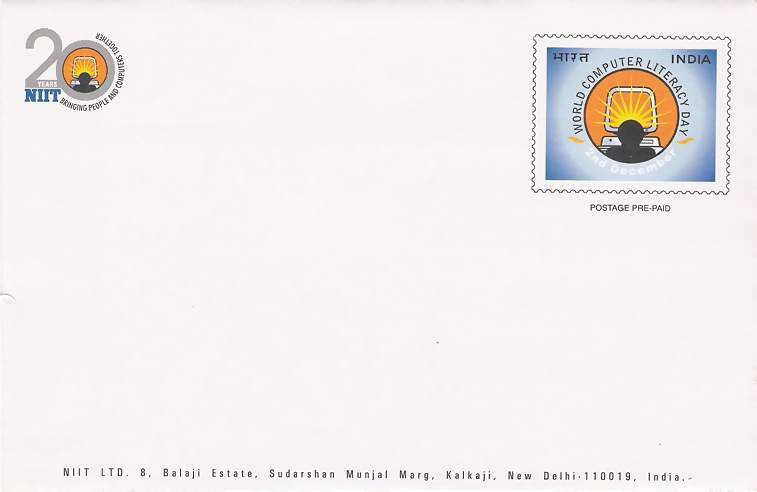 India Post also offered the complete customization of the design of the greeting card and the accompanying stamped envelope. A client can give his own design and text of the message for the greeting cards. 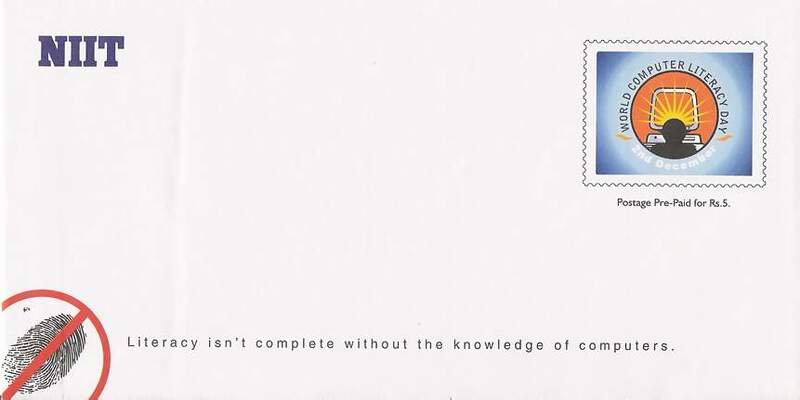 The imprinted stamp was subject to India Post’s philatelic guidelines for issuing stamps. 10,000 was the minimum order quantity and the price per card carried a 20% premium for this privilege in addition to retail price of such card. The premium was calculated after excluding the postage and this worked out Rs.13.80 and Rs.17.40 for small and medium size respectively. The logo of the sponsor was not to be included in the design. However the logo and a message (advertisement) on the back of the envelope were offered under this package. Most greeting cards in India are normally sent in unsealed envelopes to take advantage of lower postal rates for Book Post (inland mail) or Printed Paper Rate (overseas mail). 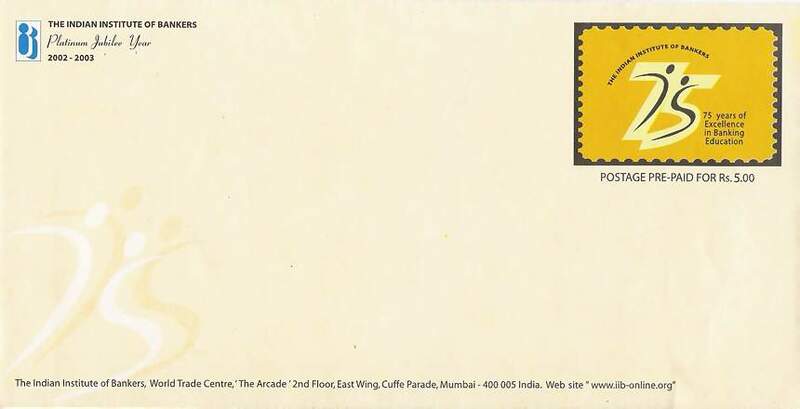 However all issues of India Post’s greeting cards have been at the inland letter rate that remained higher by a Rupee. India Post addressed this issue by providing accompanying stamped envelopes in Book Post rates. 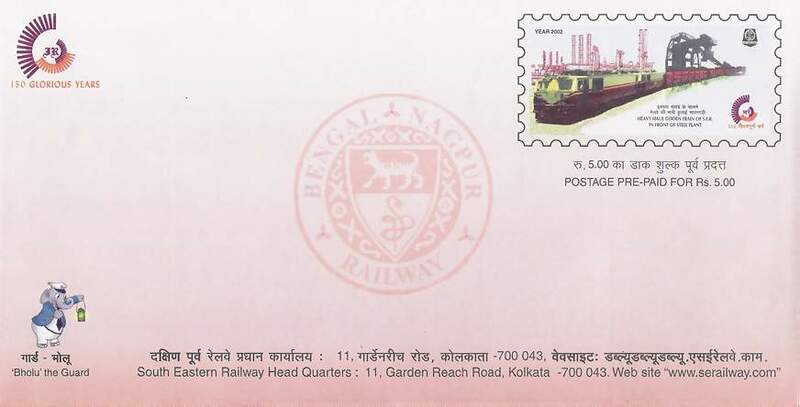 In one of the two instances of this kind of customization, the Greeting Card design # 126, that originally was issued with the imprinted stamp in the denomination of Rs.4, was customized and printed with the imprinted stamp in the denomination of Rs.3, the Book Post rate from June 1, 2001 to May 30, 2002, and also carried the inscription Book Post on the envelope. 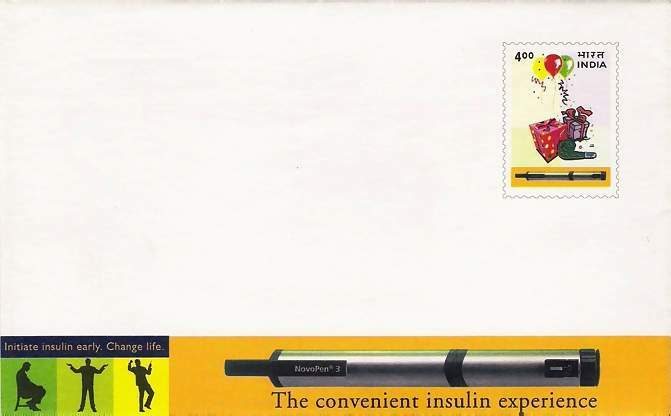 The first fully Customized Greeting Card with client’s own design was issued in January 2002 for NovaPen and was intended by the sponsors for sending Birthday greetings to the doctors. Another fully Customized Greeting Card, also issued in the first half of 2002, was sponsored by Shreemant Dagadusheth Halwai Sarvajanik Ganpati Trust, Pune for their famed Ganesh Festival. 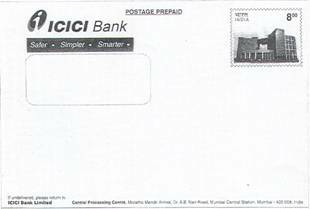 In 2001 India Post received a proposal from ICICI Bank. The Bank referring to the Greetings Post, asked for only the postage prepaid stamped envelopes without the greeting cards. 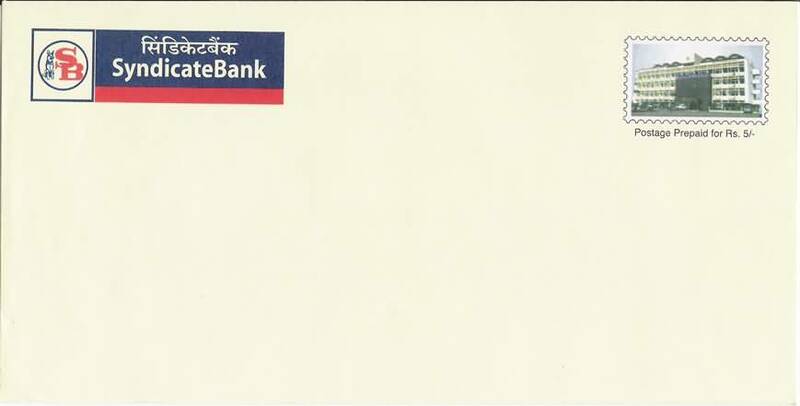 The offer received from ICICI Bank did not materialize but eventually India Post decided to introduce this new product, Customized Stamped Envelopes, in July 2001. 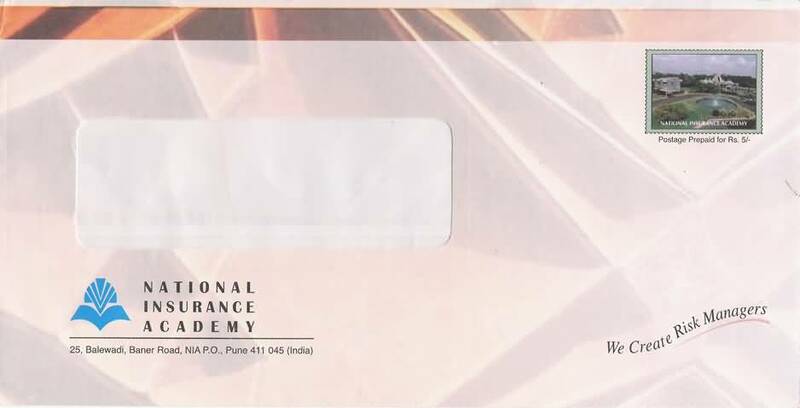 The first customized stamped envelope, was issued on December 1, 2001 for World Computer Literacy Day sponsored by the National Institute of Information Technology Limited, New Delhi (NIIT) and ceremoniously released by the then Minister for Communications, Information Technology, and Parliamentary Affairs, Pramod Mahajan at New Delhi. 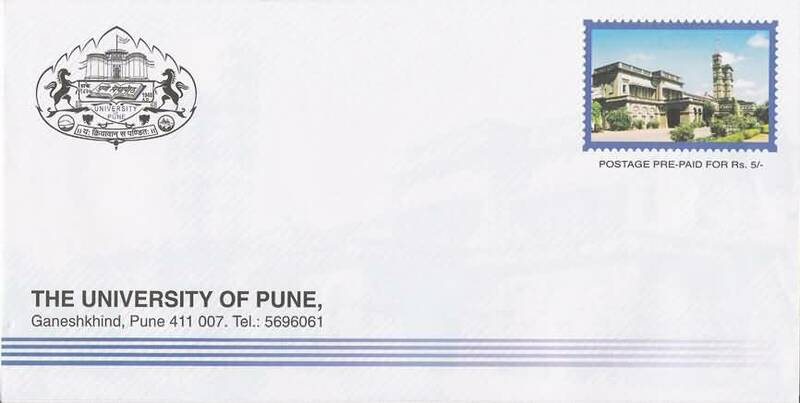 Postage Stamp Impression shall not have (a) Denomination, (b) Name of the Country in Hindi & English (First customized envelope did carry the name of the country in Hindi & English), (c) Logo of the Sponsor, (d) Any prohibited item. 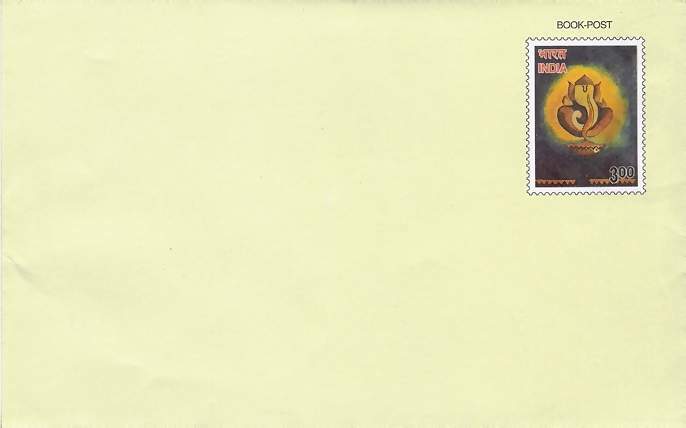 The security features included printing of the India Post logo visible only under ultra violet light below the postage impression. Every envelope will have a unique code number starting with CE (for customized envelope) then the order number and year of printing, followed by sponsor’s code and finally the serial number. 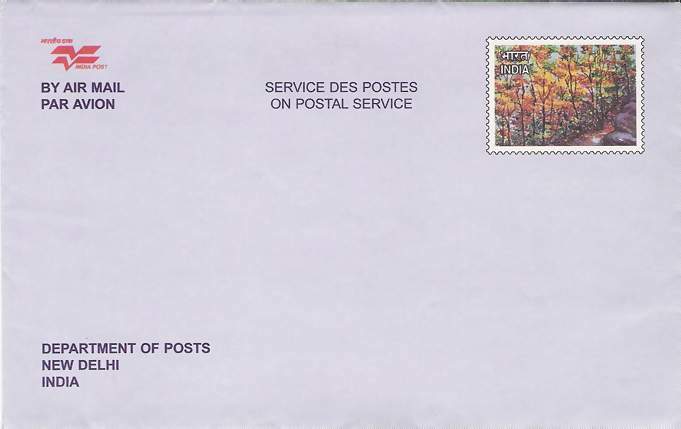 These envelopes can be mailed only at the designated post office/s and not at any other post office. 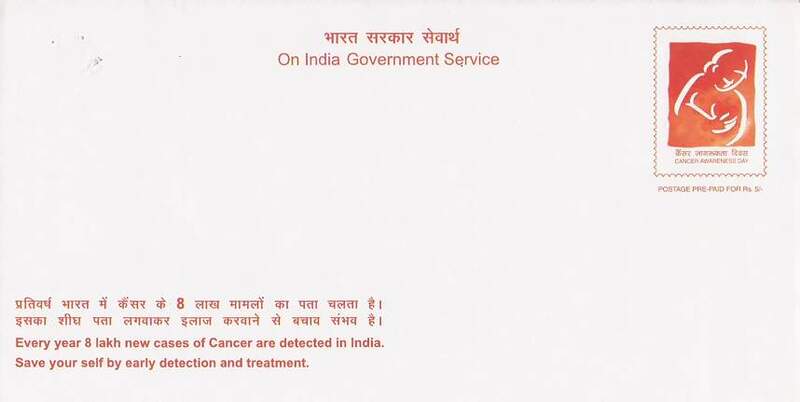 The customized envelopes come with a date of expiry usually the last date of the month one year from the date of issue and must be used within this period. 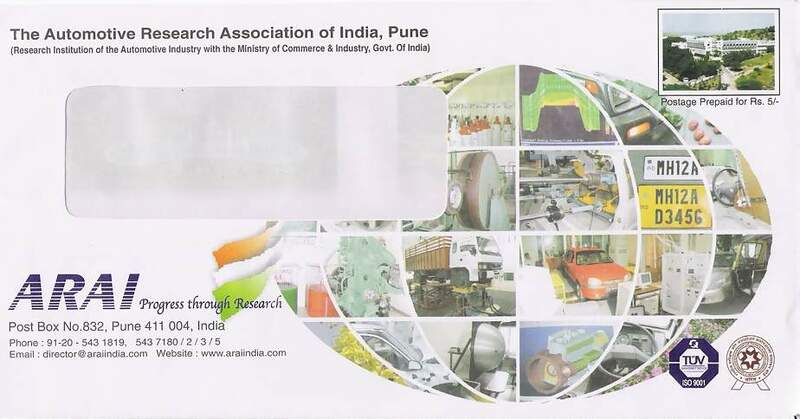 India Post offered 10 sizes of customized envelopes, in three varieties of the paper viz. 80, 90, and 100 GSM, for Rs. 1.50 to Rs. 2.30 each. In addition the client may choose the amount of postage prepaid – Rs. 5 for inland letter rate, Rs. 15 for overseas airmail letter rate, Rs. 22 for inland registered mail, as per their requirements. The sizes available are, in mm – 140 x 90, 152 x 90, 162 x 114, 180 x 135, 176 x 125, 220 x 110, 240 x 120, 229 x 162, 230 x 160, and A4. 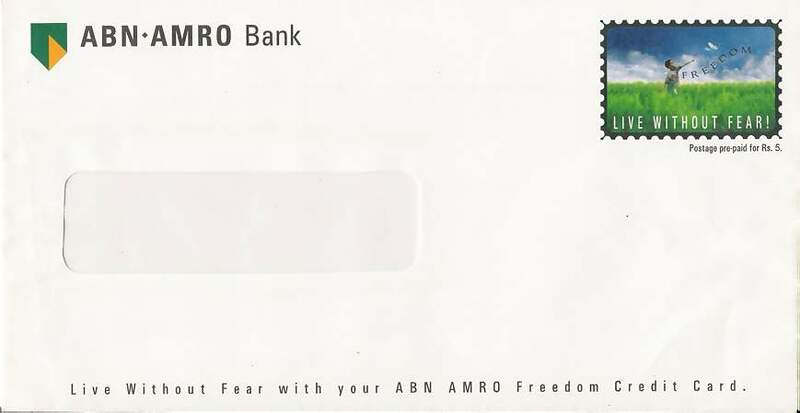 The Envelopes may be with window or without and have opening at top or side as per the requirement of the sponsor. The minimum order required was of 10,000 copies, increased to 50,000 in late 2003. The entire quantity of customized postal stationery ordered was delivered to the Sponsors and these were not made available to philatelists. 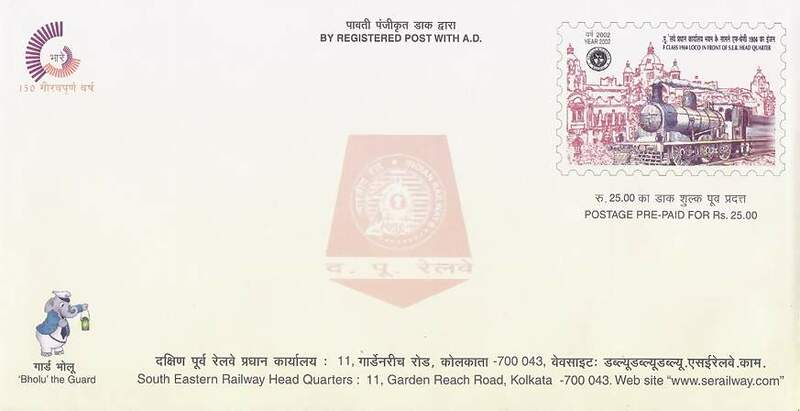 A total of 19 Customized Stamped Envelopes have been issued to date and India Post is not taking new orders since 2004. 2001 Dec, No Value Indicator, 109 x 173, ? 2001, Rs 3, 109 x 173, ? Greeting Card # 126 04. ? 2002 Jan, Rs 4, 109 x 173, ? 2002, Rs 4, 123 x 193, ? 2002 Sep, Rs 22, 80, 110 x 220, ?